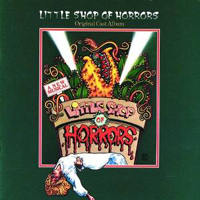 Film Soundtrack, 1986 (Geffen) (3 / 5) All things considered, the film adaptation of Little Shop of Horrors is excellent: bright, funny, thoughtfully directed by Frank Oz, and well performed by a cast that features Rick Moranis as Seymour, the irreplaceable Ellen Greene as Audrey, and Steve Martin in a riotous performance as the dentist. Among the changes for the film, all of Mushnik’s songs are cut, and “Some Fun Now” replaces “Ya Never Know.” The new song “Mean Green Mother from Outer Space” is fine, but not as exciting as “Don’t Feed the Plants.” Note also that the soundtrack album’s spoken prologue and “Skid Row” have minor but noticeable differences from what’s heard in the film, and “The Meek Shall Inherit” doesn’t reflect the movie’s cuts. Happily, while the score retains most of its original intimacy, it sounds better than ever with full orchestrations by Bob Gaudio, Thomas Pasatieri, and original orchestrator Robby Merkin; “Suddenly Seymour” is particularly thrilling. — M.M. Broadway Cast, 2003 (DRG) (3 / 5) This recording is commendable for its completeness. Everything in the score is here, including “Mushnik & Son ” (with the now-standard lyrics), “Call Back in the Morning,” Audrey’s “Somewhere That’s Green” reprise, and even the “Shing-a-ling” first act finale. 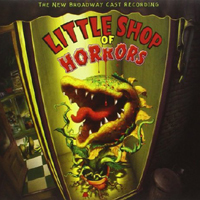 While some of the show’s sweet simplicity was sacrificed in favor of bigger takes on everything for the Broadway revival, Little Shop fans will want this cast album to be part of their collection despite its minor flaws. There are a few musical changes — most significantly, the use of the movie version’s extended title song. Danny Troob’s orchestrations lack the appeal of Robby Merkin’s, and some of the casting, particularly Hunter Foster as Seymour and Kerry Butler as Audrey, is more functional than ideal. 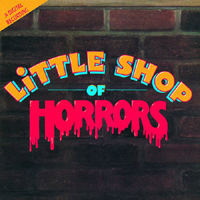 Still, the recording is very well done, and it includes five bonus tracks of demos/cut songs sung by Menken, Ashman, and original Audrey II voice Ron Taylor. — M.M.